Proteic foaming additive for cellular light concrete production. It is used in building field as insulating material for floors and flat roofs or for floor foundations for industrial and public buildings. C.O.D. : 0.6 +/- 0.2. Biodegradable by law. Suggested foam weight: 70-75 gr/lt. Light weight and insulating cements for floors' foundation, for heat insulation and slope for flat roofs, rigid floors foundation; tennis courts foundation; interspace concrete filling; raceways insulation; thermo insulating blocks; steel structures fireproofing; tunnels and pipelines compensating mass; dumps’ foundation and coverings; land reclamation and consolidation; underground cavities infill and all types of infill where an elevated thermal insulation is required. Stables and pig-sties foundations; industrial foundations; partition and tampooning slabs; ceiling slabs; concrete + Light Weight Concrete mixed panels. Blocks for outside walls; slabs for partitions; concrete and light weight concrete mixed panels for covering; foundations for elastic floors. Prefabricated panels for civil and industrial buildings plugging; walls casting; gardens ornaments. A 400 Kg/m³ density cement-only mixture is generally used to obtain a thermal insulation and an acoustic absorption, to load the structure as little as possible. The floor foundation minimum advisable thickness is of 4 ÷ 5 cm. Before casting, the l.w.c.c. foundation, the underneath concrete must be wet, avoiding the formation of large pools of water. For a better sound-proof result, it is advised to detach the l.w.c.c. slab from the partition walls by lying strips of tarred paper board, of glass wool or of rubber panels along the wall perimeter and to lay sound insulating panels under the l.w.c.c..
As such floor coverings are directly glued to the floor foundation, the most suitable density is of 1400 Kg/m³. These types of pavement can be laid down on light weight cellular cement 400 Kg/m³ slab, with a 4÷5 cm mortar slab on top, too. A 400 Kg/m³ cement-only mixture is the ideal density for such application and the standard sloping should be of 1÷1,5%. The thickness at the end of the slope should not be less than 5 cm. 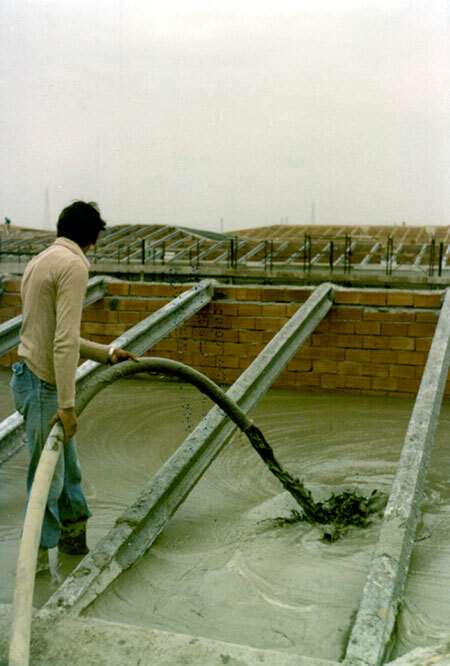 It is recommended to wet the floor before casting l.w.c.c, avoiding water pools, and in the summer time it is advised to keep the light weight cellular cement wet for 48 hours after casting, to avoid a fast dehydration. For this application the standard density is about 300 Kg/m³ of cement-only mixture. The interspace should be filled in following stages (30-50 cm at the time) every 12 hours or more. In this case, the most suitable density is given by 1200 Kg/m³ or a foundation of 400-500 Kg/m³ density, with at least a 10 cm concrete slab on top. It is worth noting that this application has given interesting results in the construction of stables and pig-sties, where the pavement insulation provides an ideal thermal insulation for the animals. Concerning these products, the density may vary from 800 to 1100 Kg/m³, depending on physical strength, thermal insulation and size of the blocks required for the application. For the blocks casting, steel or wooden perimetral moulds should be used, while the moulds for the pavement should be made of steel or concrete. To demould or fasten the setting, only high quality products must be used. g) All types of panels, including partitions. The right density for this range goes from 1200 to 1700 Kg/m³. The density for such applications should be chosen considering the required strength, thickness and dimensions of panels. For mixed slabs (normal concretes + light weight cellular concrete), it is better to cast the light weight cellular concrete immediately after the concrete in order to allow simultaneous setting and perfect adhesion between the two different materials. b) Water-cement, (or water- cement- sand) have to be put slowly in while the cement-mixer is in motion and left to mix until a pasty slurry (or mortar) is obtained. Once the slurry has become homogeneous the foam should be added, according to the quantity suggested by the following table. The mixing process should then continue until all the foam is completely mixed with the pasty slurry (or mortar). At this stage the material is ready for casting. If using a cement-mixer with paddles, which let the mixture pass through, it is important to cover the inside blades with wooden or steel boards; this to avoid the making of lumps. The l.w.c.c. should not be kept in the mixer or transporting containers longer than necessary, to avoid air-bubbles collapsing as well as setting, before it is used. Therefore, mixing, transporting and casting should be completed as quickly as possible, in order to guarantee successful results with FOAMIN C® light weight cellular cements or concretes. The material can be cured either naturally or, more quickly, by using a curing forced method. We suggest to keep the manufactured product made with air cured light weight cellular concrete, after de-molding, for a period of 28 days, before using it. We recommend treating the material as normal concrete, during setting & hardening time, which means to avoid a rapid evaporation of the remaining moisture to prevent concrete dehydration which, if allowed to occur, would cause strength lowering. Instructions should be followed in order to exploit the best physical and mechanical properties of the l.w.c.c. produced with the foaming agent FOAMIN C®.